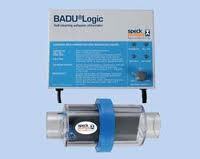 Products-> BADU LOGIC SALT CHLORINATOR. The Badu Logic range of self cleaning chlorinators is low maintenance and even lower operating costs compared to other chlorination methods and create more eco-friendly backwash water while maintaining high levels of chlorine efficiency. The Badu Logic range of self cleaning salt chlorinators is manufactured to the highest ISO standards and carries the CE mark of approval. Available in 5 sizes to suit all pool applications. 12 months ex-factory warranty under normal operating conditions from date of purchase.